Well, it’s obvious really, isn’t it? Shakespeare wrote Shakespeare, didn’t he? Only, it may not be quite that simple. You see, possibly, maybe even probably, the man we know as Shakespeare isn’t the man we know as Shakespeare. Confused? Concerned about my sanity? Well, read on MacDuff! The Authorship Question is the “deranged relative bricked up in the tower” of Shakespeare studies. It is the issue that the vast majority of Shakespearian academics would like quietly to vanish, never to be heard of again. Certainly, the town of Stratford upon Avon, currently the sixth most popular place to visit in the UK, would like it to go away as, if the William Shakespeare of Stratford is not the William Shakespeare of Hamlet, Macbeth and Othello, then Stratford is just another Midlands town. But, for those of us who have neither a professional, economic or personal tie to the man of Stratford, the Authorship Question is a hell of a lot of fun. It has everything a good mystery could hope for – conspiracies, spies, murder, aristocratic intrigue and, best of all, there appears to be no way of proving anyone’s theory to be true or false. John Michell’s book, unlike most others in the field, does not seek to promote any of the rival candidates or to defend orthodoxy but acts as an overview of the claims for most of the leading candidates. It’s an excellent introduction to the question and, written in a sardonic manner is, with one caveat that I will deal with later, a lively read. In order for their even to be an Authorship Question, there first has to be doubt as to the provenance of William Shakespeare as the author of the plays and sonnets. Unfortunately, for the Stratfordians (as the supporters of orthodoxy are known), this is rather easy to show. Indeed, there is remarkably little positive evidence of him as the author beyond Ben Jonson’s introduction to the First Folio in 1623, a few faked-up buildings in and around Stratford and the fact that his name is on the front of the plays. William Shakspeare (the man is referred to as Shakspeare and the author as Shakespeare in Authorship Studies). There are huge gaps in Shakspeare’s personal history and what there is of it suggests a country boy with limited education who grows up to be a small time businessman and property dealer who becomes an actor, gets involved in some rather dodgy enterprises, makes his money and retires to the life of a rural gentleman. And this is the starting point for the anti-Stratfordians. They point out that there is virtually no connection between the type of man Shakspeare was and the kind of author Shakespeare was. According to various experts, Shakespeare must have been, amongst other things, of noble birth, a trained lawyer, familiar with France, Italy and Denmark, a soldier, a botanist, a highly-educated individual with a detailed knowledge of Greek and Roman classics and, in short, someone very different to Shakspeare. The anti-Stratfordians also point out another uncomfortable fact. There are very few references to Shakspeare by his theatrical and literary contemporaries. How can this be the case for someone of his renown which was great even in his own time? Indeed, other than the Jonson encomium, those references that do exist suggest that Shakspeare was more of a copyist, plagiarist or manuscript thief than the greatest playwright of his age. There is much more to the argument, as Michell relates, but this is enough to give a flavour of the doubt that may be cast on the authorship of Shakspeare. The next step for the anti-Stratfordians is to come up with an alternative candidate and here the fun really starts. In no particular order and without being exhaustive, claimants for Shakespeare’s crown include Francis Bacon, Christopher Marlowe, the Earls of Oxford, Derby, Rutland, Essex and Southampton, the Countess of Pembroke, Sir Walter Ralegh, Cardinal Wolseley and Queen Elizabeth I herself. While you get your breath back from the laughing fit this will have caused you, I would say that, in addition to more serious writers, contributors to this field have included a man called Looney and a woman who actually did go mad. I am not going to rehearse the arguments for any of these candidates in particular – you should go and read the book but, suffice it to say, there is plenty to be said for many of them. This is, of course, where the problem lies. It is possible to read almost anything into the text of Shakespeare’s plays and sonnets. The champions of various candidates make opposing claims about the nature of Shakespearian characters such as hamlet, who is claimed to resemble at least three of the major candidates. 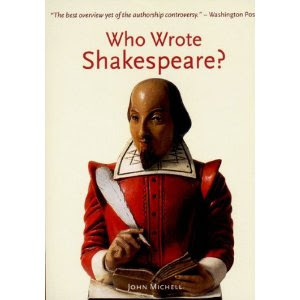 Writers on the topic, especially the Baconians, tend to be fascinated by cryptography and word play and create all sorts of fantastical claims for the text of the First Folio and other contemporary texts which, they say, show that Shakspeare wasn’t the author and that their candidate was the real mastermind. To give but one example, the existence of a thick black line around the edge of Shakespeare's face in the engraving in the First Folio is claimed to show that the dface is a mask behind which the real author hides. Having said this, there is plenty of much more serious and persuasive evidence to be considered. The huge quantity of evidence of differing persuasiveness leads to the one criticism of Michell’s book. In order to cover each candidate properly, he sometimes gets bogged down in detail. This isn’t really his fault and, in his defence, he has tried to distil thousands of pages of Authorship Studies material into a readable summary. The truth of the matter is that, in the absence of new evidence, it will never be possible to settle the Authorship Question. Given the repressive nature of Elizabethan England, the intrigue that surrounded the Queen and her counsellors and the lack of respectability of the theatre, it is eminently reasonable that the real author, if he or she were noble, would want to keep their identity a secret. Given that backdrop and the real doubts about Shakspeare as author and endless speculation is possible. So where does Michell stand? Michell can’t quite bring himself to say it but he is clearly an anti-Stratfordian and posits a hypothesis of a group of writers, masterminded by Bacon, publishing plays that were intended to educate the play-going public in Bacon’s ideas and beliefs. Where do I stand? Well, it is safe to say that I am no longer a Stratfordian. I did flip-flop between candidates as I read the chapters devoted to each of them but, if push comes to shove, I am probably a Marlovian now although who knows where I will stand if I read more on the subject. And read more I will because this is fascinating and fun stuff. I've only been able to give a flavour of the subject here and I would highly recommend Michell’s book is an excellent primer on the question. Still think that Dr Who going back to dig into the Authorship Question would make a great episode! I'm reading The Eyre Affair by John Fforde right now, and in his fantasy universe, books are so revered and beloved that people like the Marlovians with whom you now identify become armed militias trying to get people like the Stratfordians to agree with their point of view. It's quite fun for someone who is in love with literature. Alex - I'm not a Who gfan but I would agree with you on that. Heather - Yes, I love Fforde. He is incredibly inventive.